Home Tips	Rub’n Buff-My Favorite New Product! Rub’n Buff-My Favorite New Product! TGIF, Friends! I am so excited to tell you about a new product I found. It’s called Rub’n Buff by Amaco. It’s a metallic wax finish used for adding an elegant sheen to nearly any finish. Want details? 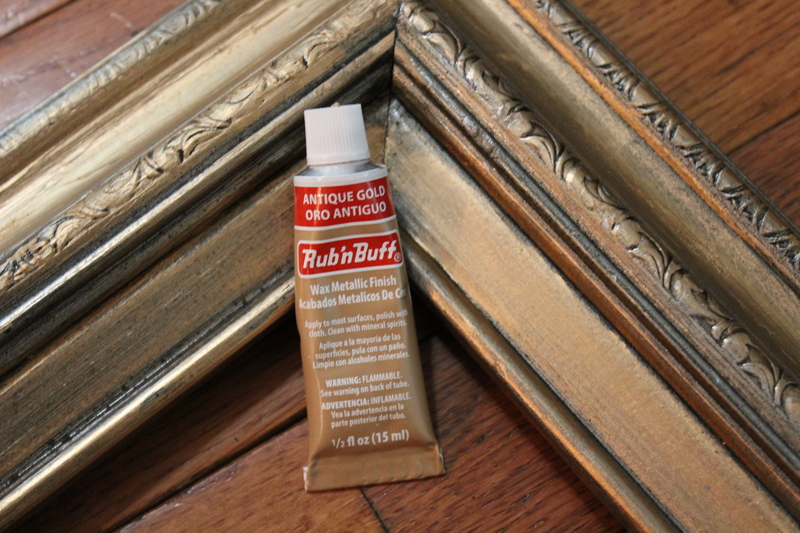 I saw Rub’n Buff for the first time recently online while I was searching for gold leaf paint. Rub’n Buff comes in a small 1/2 ounce tube and costs about $8.34. A half ounce doesn’t sound like much but it goes a long way. One tube can cover 20 square feet apparently. I bought the Antique Gold but it also comes in other metallic finishes such as silver leaf, copper, pewter etc. You can even buy a sampler pack of 12 different finishes on Amazon for about $33. I chose the antique gold color because it best suited my projects. (I would gold leaf everything if I could.) I have a large frame I’m planning to use at the wedding but I wanted it to be gold instead of blue. The directions on the back of the packaging says to use your finger or a cloth to rub on the wax. It also says you can wash it off of your hands using soap and water. So, I used my fingers but the gold paint doesn’t come off easily with soap and water. Next time I will use gloves. My frame started out blue with a bit of silver leaf. I would also recommend trying the wax on a small inconspicuous spot or on a different piece altogether. It takes a few tries to get the right amount on your finger and decide how much surface you want to cover. At first I put too much on at a time and I filled in too much of the recessed areas. I think it looks better if you rub the wax onto the raised parts on the frame leaving a bit of the original color behind. In retrospect, I probably would have painted the frame black first and then gold leafed over it. (Wendy) Do you see what I mean about not putting too much wax in the crevices? I think it gives the piece more dimension. This product is inexpensive and easy to use. And, it’s not nearly as messy as actual gold leaf and a fraction of the cost. I painted this entire frame in about 10 minutes. I might add just a bit more of the Rub’n Buff or maybe I’ll use some dark wax to add even more depth. I painted this large frame and used just a small bit of the wax. I have tons left over for more projects! I’ve read you can also use this wax on crafts, antiques, home decor and chandeliers! Hmmmm. I might have a chandelier or two sitting around just waiting for a little pick me up! The name says it all. Rub it and buff it! ***Note: This product is flammable and contains petroleum distillates so please use caution. Below is the finished frame.